Birstwith trimmed Helperby’s lead at the Theakston Nidderdale League Division One summit to just two points courtesy of a nailbiting win over West Tanfield. Jon Millward’s men were dismissed with just 129 on the board at the Slengingford Oval, but managed to defend that total, taking the final home wicket with just one run to spare. Tom Croston (47) and James Riley (32) were the mainstays of the Birstwith innings, Angus Shaw snapping up 5-23 and Nick Virr 3-17. Tanfield lost wickets at regular intervals in reply, however they were within touching distance of victory when they were bowled out on 128. Jonny Luty top-scored with 33, while Sam Barker was on fire for the visitors, finishing up with a haul of 6-22. Leaders Helperby had to settle for just six points from their home clash with Masham after rain brought matters to a premature conclusion. The away side were 101/3 when the heavens opened, Andrew Smith unbeaten on 32. Ouseburn’s encounter with struggling Knaresborough Forest was another game that fell victim to the weather. Ben Mackril (78), Aussie Matt Nicholls (65) and Jamie Bryant (62 not out) hit half-centuries in the defending champions’ 291/6. Jayden Harris took three wickets for Forest, but rain meant that they could only reach 130/6 in response, Mark Rogers contributing 37. 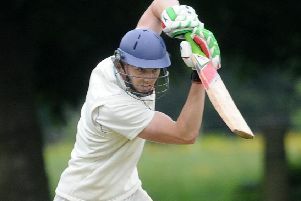 Ouseburn ace Mackril completed a fine all-round display by getting rid of three visiting batsmen. Third-placed Burton Leonard’s five-match winning run came to a halt on the road at Goldsborough, Saturday’s clash ending as a rain-affected draw. Home batsmen Mike Cockle (81 not out), Luke Boniface (51) and Australian Jarrod McPhee (37) all looked in good touch, helping the hosts to 215/6. 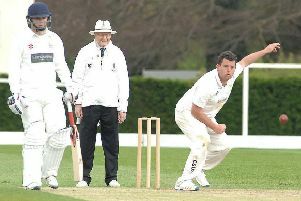 Jon Duffy effected a trio of dismissals for Burton, for whom Laurie O’Connor struck 47, but bad weather meant that only 30 overs were possible in the second innings. The away side closed on 111/5 with Henry Saul grabbing 3-15 for Goldsborough , but both teams had to settle for a 12-point return in the end. Bottom-of-the-table Bishop Thorton endured another afternoon to forget when they were skittled for 86 chasing Darley’s 208/7. Scott Clark’s excellent knock of 91 put the visitors in a strong position, before Duncan Naylor (27 not out) and Ross Sands (25 not out) added a useful 40-run partnership at the end of the innings. Joe Stobbs (3-34) and Toby Hainsworth-Brear (3-42) impressed with the ball for the Curlews, but their batsmen were to fare less well. Andrew Hyland did manage a defiant 34, but he was one of only two home players to reach double-figures and a stunning 7-39 from all-round star Clark ensured that Thorton were back in the pavilion after 26 overs. Wath & Melmerby are still in search of a first success since the opening day of the season following a seven-wicket reverse at the hands of Dacre Banks. Dan Harris made 47 of the strugglers’ 137/6 in 35 overs, but that total never looked like being enough. Sam Mooney then hit an unbeaten 74 to guide Dacre home in the 28th over. Pateley Bridge continue to lead the way in Division Two after securing a sixth win in six completed fixtures. They didn’t have things all their own way in a rain-affected home encounter with Scotton, but eventually made it over the line seven wickets down. The visitors slipped to 23/5 batting first in the face of some unplayable bowling by Tom Fryer (5-28) before recovering to make 100/8 from their 31 overs, Tom Sturdy reviving his side with an unbeaten 38. Bridge looked to be cruising home as Michael Eglin (39) and Colin Chadwick (27) produced a first-wicket stand of 70, however they then lost seven wickets for just 30 runs before eventually finishing the job. Iain Campbell impressed for Scotton with a return of 4-12. Simon Dwyer hit another big score for Kirk Deighton as the league newcomers climbed up to second place in the table. Dwyer, who has been in prolific form all season and made a ton against Burnt Yates last month, struck 15 boundaries in his knock of 102 on the road at Studley Royal 2nds. His innings helped last year’s Wetherby League champions rack up 236/4, skipper Richard Ward (39), Matthew Wall (34) and Gavin Mills (30) all chipping in. Royal were then completely blown away in reply, skittled with just 53 runs to their name as Jon Watkins and Mark Harland both helped themselves to 3-5. Harrogate Strays and Raskelf played out a thrilling tie. Toby Easthaugh contributed 46 to steer the Roosters’ 3rd XI to 118 as Jake Petty snapped up 4-15. Matt Goddard (65) then put Raskelf in control, but they lost their final wicket with the scores level, Robert Horbury taking four wickets. A fabulous bowling display by Ethan Westerman couldn’t save Spofforth from defeat to Burnt Yates. He bagged 7-33 as the hosts posted 183, Chris Byrom hitting 37, but Joe Horne’s men came up just short in reply. Skipper Horne led the way with 60, however Spofforth were bowled out for 174. Bash Khan smashed a stunning century as rock-bottom Blubberhouses attempted to claim a first victory of the campaign, but rain caused the early abandonment of their clash at Alne. Opener Odin Dusebury made 73 alongside Khan who plundered 129 to guide the struggling visitors to 278/6, Ryan Raper scooping three wickets. Alne progressed to 71/1 in 20 overs with Ryan Beaumont unbeaten on 55 when bad weather forced the players off. The clash between Killinghall and Markington was also brought to an early conclusion by the rain. Wayne Dennis hit 50 at the top of the order for the away side as they were dismissed for 147, thanks largely to some excellent bowling by ‘Hall’s Dan Atkinson (5-29).